Selpius Bobii, human rights activist. [This hearing was held to hear the response of the prosecutor’s team to the demurrer from the legal team of the defendants. The names of the twenty members of the legal team assisting the men on trial were listed. At 6am, heavily armed members of the security forces took up their positions in front of the Public Prosecutor’s office. At 7am, visitors and members of the legal team started arriving at the courthouse. Each visitor was required to register his/her name, while showing their identity card. Following this, each of the visitors was investigated. Journalists and members of the legal team were also investigated. Some members of the legal team as well as some of the journalists attending the trial protested, but the protests were ignored and the investigations continued. The security forces paid no attention to this and continued to move closer to the truck, then started pulling down Forkorus and his colleagues from the truckLocal human rights activists, including Mama Josepha Alomang, started complaining to the security forces and called on the chief of police there to order his men to move away. As some of the police fell back, Forkorus and the others began to get down from the truck. As they were getting down, the visitors began to sing hymns and to say prayers in front of the entrance to the courthouse. The hearing of the trial began at 9am. The presiding judge asked the men whether they were in good health, but none of the five men made any response. The judge repeated his question three times, but the men still remained silent. On seeing this, the judge remained silent for a while, then asked the prosecutor to read out his response to the demurrer, in which he insisted that the charges against the men were in accord with Article 106 of the Indonesian Criminal Code, whereupon the chief prosecutor asked the judge to continue with the trial. After this, the judge announced that the following hearing would take place on 14 February, to hear the reaction of the panel of judges to the demurrer. Before the hearing drew to a close, Gustaf Kawar, a member of the legal team, protested against the investigations that had been undertaken by the police of the persons attending the trial as visitors. He asked: ‘Is this an open trial or is it closed to the public? If it is an open trial, visitors should not be investigated and there should not be such heavy guarding round the courthouse. The presiding judge said that this was in accorded with the proceedings required by the security forces, over which they have no control. 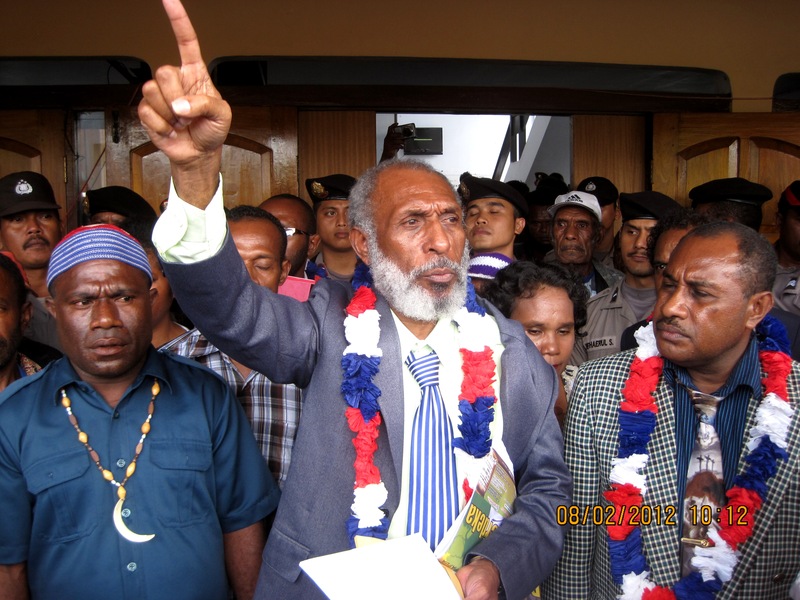 After the hearing closed, Forkorus and his colleagues held a press conference at which they protested against the charge of treason (makar) and protested against the heavy-handed guarding around the courthouse, the many arrests that continue to be made [in Papua], the many people in prison and the shooting incidents against Papuan people. As this was going on, some of those outside the courthouse unfurled banners saying PAPUA MERDEKA!. 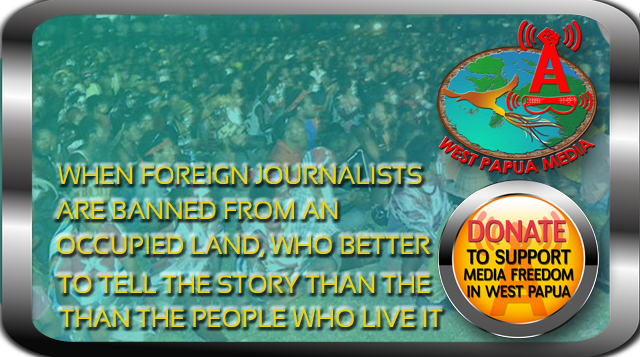 INDEPENDENT PAPUA!, shouted this slogan and handed out copies of a press release. Many of those who were hoping to attend the hearing were unable to do so because it was raining very heavily. Keep getting the information out. The world must know what i happening. Without this site we are blind.